friendly, efficient, professional and they listen a rare quality these days. This warm and cozy home was a pure joy for us to visit. The views of the surrounding sedona red rock mountains from both inside of the house and from outside on the decks is nothing short of epic, especially at sunrise and sunset. Also, the moon rise and starry night sky are amazing. The house is very comfortable and all furnishings have been tastefully upgraded,there is even a Keurig coffee machine. The home is minutes from all the sedona attractions and the Whole Foods grocery. Outside is a grill and a table for dinner under the stars. Highly recommended and we will be returning. Thanks to Gina for being proactive and notifying us in advance that the home we originally booked had the heat go out and we were going to have to change property locations. She was able to work with the owners of a new listing that agreed to our stay at the already paid amount. Definately an upgrade on the property, thank you owners Heidi & Harrison. Awesome work on a snowy New Years weekend. Thanks for sharing your beautiful home with us! My husband and I, along with our two 9 yr. old boys are traveling here from Chippewa Falls, WI. We are really enjoying the relaxing atmosphere of the country! We have taken the last few days to explore the area. It sure is beautiful from a helicopter! We were also able to do some hiking and really enjoyed the outdoors here. Our boys are also really enjoying the area around the house here. Spending every minute they can outside. They have even mentioned we should live here :-) Thanks again for letting us stay at your beautiful home on this beautiful property. Very helpful and easy to work with. This home was beautiful and spacious. Great for families with kids as on room has bunk beds. The outdoor spaces allow you to take full advantage of the amazing views. Excellent. Staff members were knowledgeable of maintenance and servicing procedures and issues were quickly dealt with even if working after hours was required. Most commendable. The maintenance/ repair man is very pleasant and helpful and does excellent work. Recalls have never been needed. All staff members we have dealt with have a very friendly, helpful attitude. Just super ! Absolutely love it. The amenities and housewares are very adequate. Any special , additional items are easily transported from our northern residence. We definitely want to return. We loved staying at the vacation home in Cottonwood and will definitely return. 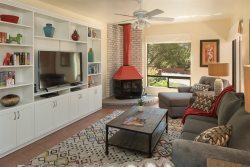 The home's amenities and the location to downtown Cottonwood were fabulous. Everyone was helpful when needed. There for 3 months - we enjoyed our stay. Great location, and my Husb. loved sitting in the back watching the birds.